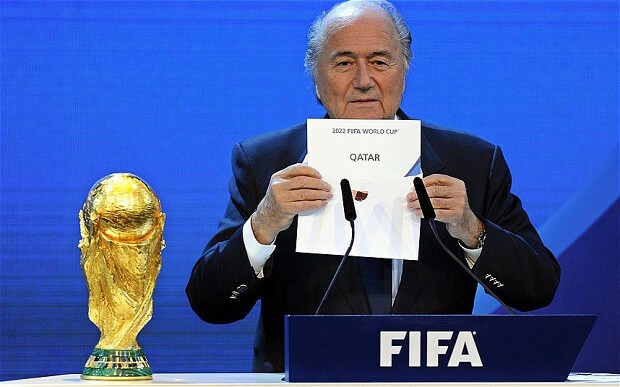 FIFA’s recent announcement that the 2022 World Cup in Qatar will take place in November/December just undermines what everyone who lives outside of FIFA headquarters knows – that the World Cup never should have been awarded to Qatar in the first place. At this point, the apparent corruption, miscalculations, lack of commonsense judgment, and all-around bloated, cartoonish villainy surrounding FIFA and its Qatar World Cup is so ridiculous that it hardly matters anymore what time of year the tournament takes place. FIFA will do what FIFA wants and that has become the big problem. Last May, ESPN’s Jeremy Schapp produced this heartbreaking story for E:60 about the mistreatment of foreign workers in Qatar. It is essential viewing, stunning in its report of workers lured from countries like India, Pakistan, and Nepal by the promise of decent wages (which they could use to help support families back home) to work on stadium and infrastructure construction projects for the 2022 World Cup. Unfortunately the E:60 story made few ripples in the media, swamped instead by the pre-Brazil 2014 World Cup hype. Naturally, people will find reasons to protest the World Cup taking place in just about any country in the world (Russia 2018 is a topic for another day), but the lack of human decency toward workers in Qatar as reported by Schapp is particularly grievous. Disturbingly, FIFA has the leverage and resources to easily stop these abuses yet stubbornly refuses to do so. At the very least FIFA could and should pay for full-time inspectors on the ground in Qatar to help ensure these workers receive basic, fair protections. FIFA would never miss the money it would take to construct basic apartments for these workers that would easily be more luxurious than the sites where so many currently dwell. Short of sponsorship pressure on FIFA, the creation of an alternative governing body whose membership includes influential FAs seems the last avenue at this point to effectuate change. A modern day Lamar Hunt (who spearheaded the launch of the AFL to compete with the NFL) is needed to form a constituency of UEFA powers unhappy with FIFA’s continual failings with other soccer heavyweights (some CONMEBOL members, maybe Mexico) and the USSF. A competing “World Football Championship” held in the same summer (well, the same year at least…Qatar) as the World Cup that featured Germany, England, the Netherlands, France, the U.S., and others would be a big draw. Corporate sponsors won’t be so interested in a FIFA World Cup lacking nations with large populations of wealthy potential customers. There aren’t many with the rebel-disposition and financial resources to pull something like that off (Mark Cuban?) but with the right financial incentives, it wouldn’t be impossible. They have been loosing sponsors but not any of the “FIFA Partners” Adidas, Coca Cola, Hyundai/Kia, Visa, and Gazprom. To start up another tourment you could go after FIFA Partners big rivals like Pepsi, Nike, Toyota, Mastercard and maybe try and pick up some of the sponsors that ended their deals with FIFA like Sony, Emirates Airlines, etc. Well, several national associations don’t seem concerned about the human rights abuses in Qatar and Russia, let alone their own countries.